and managing the land to its natural potential." Croghan Meat Market is a retail store and specialty meat processing plant that sells traditional quality meats. Eddie's Meat Market is home to Eddie's Ring Bologna and where old fashion services can still be found. Payment is Cash or Check. Sliced deli meat is available along with cheese. Cut, Cubed, grind or wraped meat. Smoked and cooked kielbasa, feathers "Eddies Ring Bologna, smoked breakfast sausage, jerked beed and pork, marinated chicken, iceladic haddock and other seafood options. A globally trusted producer of delicious foods, The Kraft Heinz Company provides high quality, great taste and nutrition for all eating occasions whether at home, in restaurants or on the go. Lowville Producers Dairy Cooperative offers a variety of products including cheese, cheese curd, maple syrup, and Croghan Bologna. Miller's Meat Market is a butcher shop and specialty grocery store. Monnat's Country Store is open Monday thru Saturday 8AM - 6PM. Be sure to check out their "gift shop" when you stop for groceries!! Carries their own pan sausage, jerked beef and jerked pork. Variety of groceries and Amish hand-made quilts, soy candles, framed prints and more. "From your field back to your freezer" Beef, Pork, Lamb, Goat. All products are professionally vacuumed sealed and labeled. 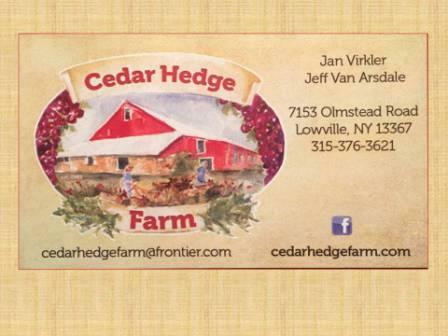 Tug Hill Vineyards is focused on producing the finest hand - harvested, hand-crafted, premium New York State wines, along with a great backdrop for your special wedding day and u-pick Raspberries and Blue Berries.